As you look at a modern bicycle today, I think most people take it’s shape and function for granted. Some are made for cruising while others for exercise and competition. 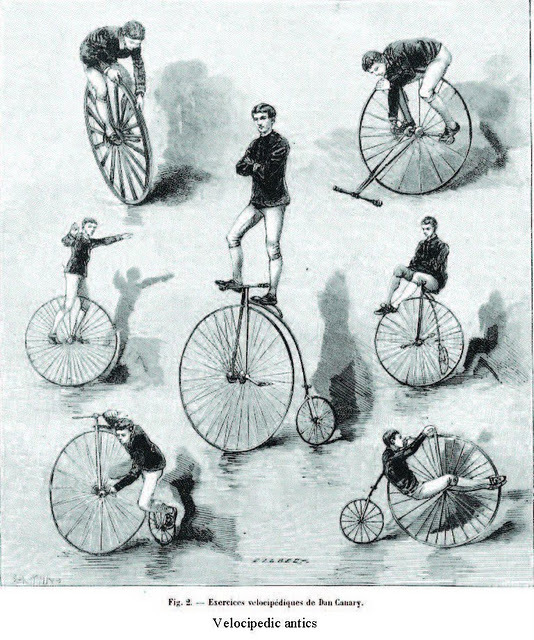 But to the Victorians, and much longer before them, cycles were used as a “enjoyable necessity” to say the least. (*Note to everyone: Yes I know that “Victorian” is essentially British and that most of these inventions were of other countries origins, but allow me to at least express the time period as such instead of “19th century” and so forth. I will try to be lenient in the term. Thank you.) Many people had to have them for jobs or to get to their jobs or for a job itself. Note how I say “cycles”…not bicycles. Well, you can’t expect everyone to be right the first time now can you? 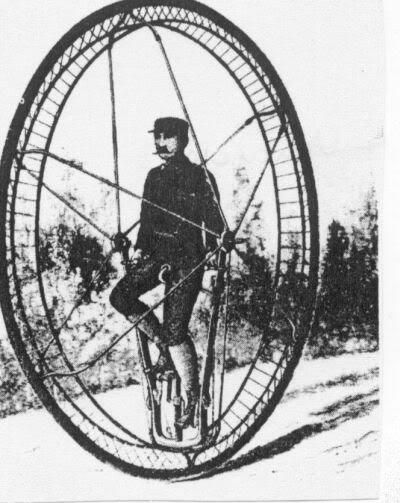 As cycles were first being designed, certain designers had a certain image to uphold. These were the times of the gentleman after all and one had to look proper when seen in public. 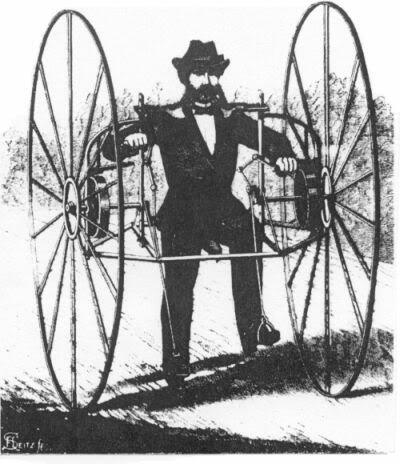 The first, what is considered to be the first human powered two-wheeled transport, was built in the early 1800’s and wasn’t really a “cycle” since one had to push the wooden frame with feet on the ground. These were called “dandy horses” or “hobby horses” and by George! they made sure they looked like them too! Nowadays this is a child’s toy but back then it was an attractive way to court a lady…after she was done laughing at you of course. 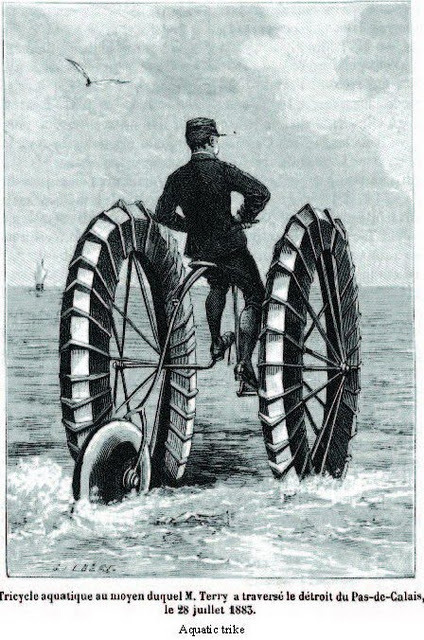 The Unicycle – Let’s start with the fewest wheels first, shall we? Are you claustrophobic? Enjoy that shut-it feeling after being tossed in jail for insulting the constables wife with propositioning her for five shillings? Then sadly this device may not be for you. But how freeing it may feel as you zoom around the country while managing to avoid rocks, sticks, water, holes, children trying to hit you with sticks, or the occasional sheep herb. But that won’t bother you since you will have shade above your head to keep that pesky rain from…well, it will get you wet anyway, but not so much! One worry, balance is key. If you do manage to fall over (highly likely) than getting out of the unicycle cage may present you with a problem. One last thing, horses can still run over you, ride with that in mind. 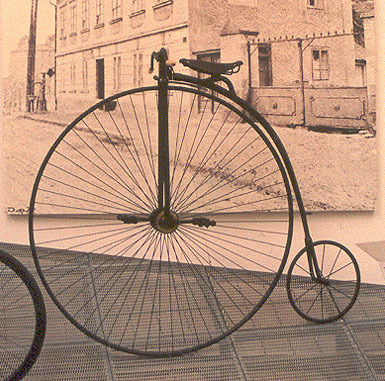 The Penny Farthing – Such a curious name but well earned. This is the cycle of the well-to-do! 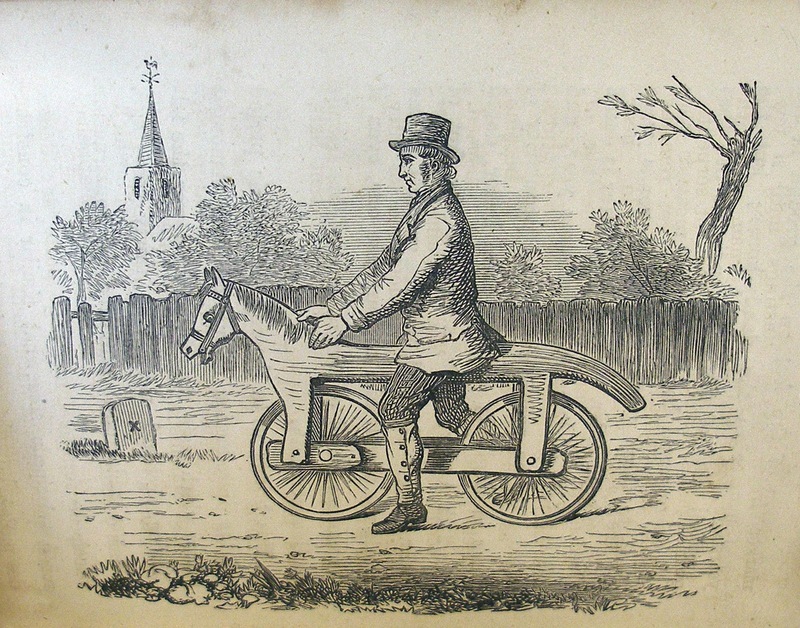 You, dear gentleman, will enjoy riding about since you can now literally look down on everyone. That’s right! No longer will you have to meet other men at eye level. You can now demonstrate your greatness by gliding past them as a giant among men. How do you get on? My fine fellow, this is easy enough to master with practice. Just make sure you are around a hill, stair, a small child that you can use as a step, or a convenient homeless person that is asleep on the sidewalk to help give you a leg up. *Warning, high altitudes may cause delirium and self-righteousness in very rich individuals for the purpose of displaying income or wealth. Waltzing Cycle – Not quite as fit as the missus wants you to be? Solve your pudginess with this multi-functional cycle: You get where you need to go by almost killing yourself in the process! Yes sir! This bicycle will get you knocked into shape by the end of the month guaranteed. No worries that your hands will probably be so sore once you finally reach your job that your boss will fire you for being lazy. You can just show him your mode of transportation and explain it’s benefits. And that’s not all! Since you are traveling in something about the size of a modern car, you will have the same problems with traffic and heckling from children as well. Will the joys of embarrassment never end? 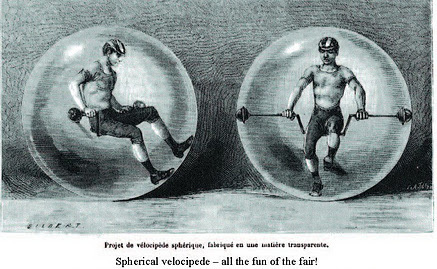 Spherical Velocipede – The term 360 view has never been taken so literally! What a wonderful world you will see as you manually walk your way around it in this incredibly easy to operate cycle. Simply sit in the center, put your feet on the…clear…glass/rubber…whatever they used before plastics…wall and go at it! You will be the center of attention no matter where you go so make sure you dress appropriately…or just make sure you dress period. This is gentlemen times, sir, and you will have your mustache combed accordingly. Turning may prove a tad difficult…not to mention the fear of rolling the wrong way..or stopping on a hill. 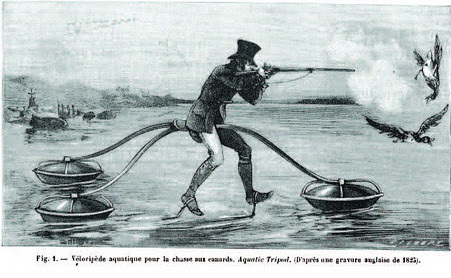 Aquatic Velocipedes – Ever have that dream where you walk on water to get to the other bank where you can get a pint for a single bob instead of two? Or how about racing a full team of rowers and winning? Well, a dream no longer my friends! Here is a sensational solution! Pedal your way across a small lake with only a slight margin of a chance that you could drown. Do you hunt and see a paddling of ducks across the water that you would have normally walked around to get to? Well, this could very well make things easier for you. Perfect your aim and pray the recoil doesn’t knock you down since you are tied to the cycle. Again drowning is a concern worth looking into. Photo-Trike – I don’t even know how to begin. What a marvel! 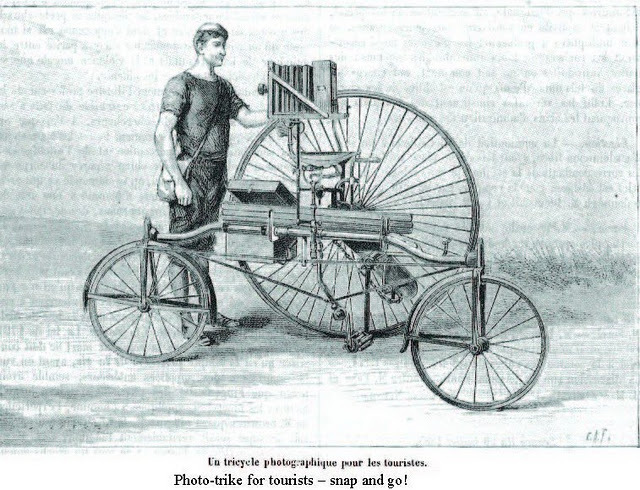 If you are a weary traveler and hate lugging all that camera equipment around with you (I know I do) just build it into your very own tricycle! No need to dismount it or worry about the weather as long as you chemicals are kept closed up you’ll have no problems. Never seen London Bridge before? Neither will your friends since you shouldn’t stop on the bridge for an exposure so all your pictures will be quite blurry. The magnesium flash mount on the top for those dim scenes may startled many residents or cause a gentle woman to faint so please be mindful since this could land you and your camera in jail and those will not be very appropriate photos to show you family and friends later on. Memories…such memories. 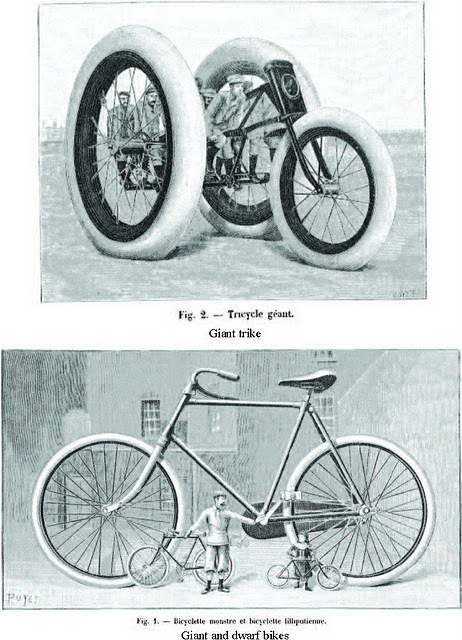 Giant Cycles – I’ve got nothing on this. Really. It is impractical, silly and useless, to be honest. Why make a bike that no one can sit on or use in a conventional way at all? What is the point? Not even the tallest person in the world would need this! Unless humans start breeding in the 20 ft and higher range I don’t see these going anywhere. 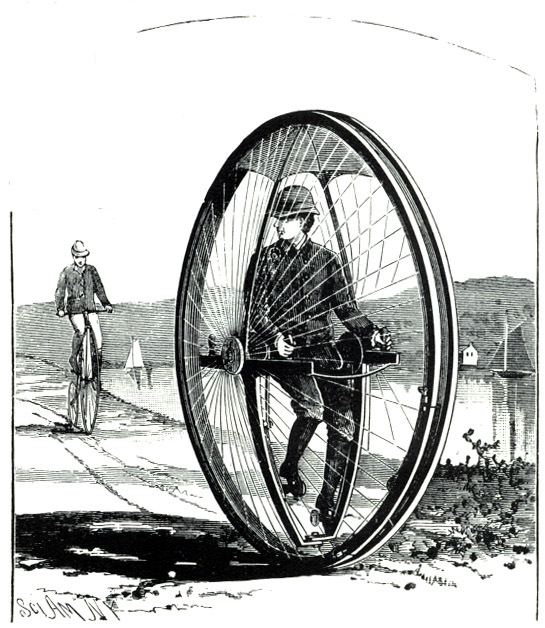 I’m not a fan of multi-person cycles and you would need at least a dozen to make this work. Sorry, that’s just what I think. Battery Powered Trike – I was waiting for someone to event a lazy cycle. Hate to pedal or move you legs in any fashion because you feel you r money should save you from the disappointing sensation of walking? No problem! 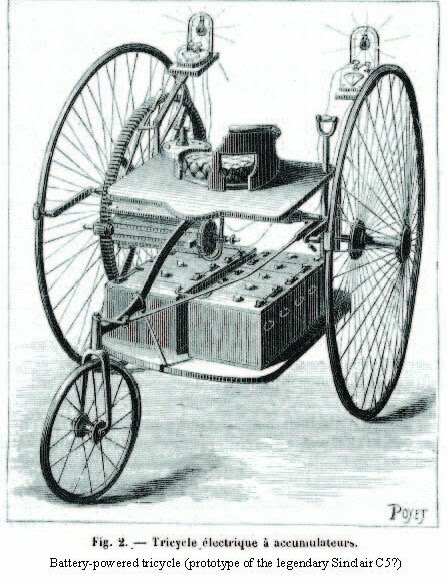 Just plug in the expensive non rechargeable battery under this tricycle and then connect the controls on the top and get ready for a shock since that battery is not truly as grounded as you would like. And guess what? When that battery dies somewhere in the middle of a field out in the country you will have to walk your lazy self back to your friends house and complain over the lack of ingenuity your century is producing. Thus, a setback for battery powered trikes. 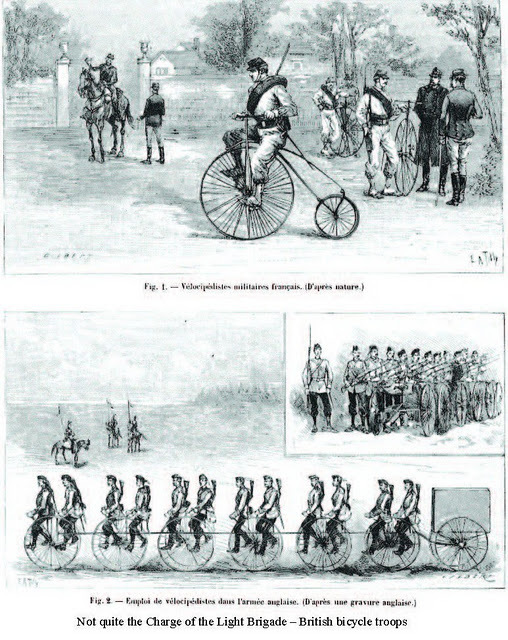 British Cycle Troops – What? This is silly now. I suppose if a troop is traveling a long distance without cause for a threat than fine. However, what good would they provide afterward? I can’t see it being used for combat but for 12 men on one cycle? I can see how my words are going to slap me back for saying that (snicker). Seriously though. These men sleep, eat, shower, and fight together…now we’re going to make them ‘cycle’ together as well. Please give a man a horse or his own personal cycle please like the photo above. What if Johnny gets lazy and doesn’t cycle with the rest, huh? What then? 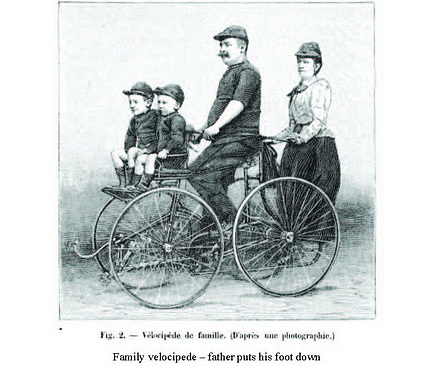 Family Velocipede – It’s like the family car…that’s your father still has to work on. Need a family outing? Tired of those stuffy, fast trains? Need to be in control of your speed and distance? Than this is just for you! That’s right dad, all you have to do is be at the center of attention…just the way you like it! There’s even a seat for the little woman right behind you so she can roll her eyes and make inappropriate hand gestures behind your back. What you can’t see won’t kill you! Note, try not to reproduce more than two children since all the weight is on you and your wife. There are some good examples of early cycles. Now that you have the basics down, you can do some impressive tricks to get the ladies hearts fluttering. But make sure you don’t fall off though…you will look silly and there is no help for you after that point. Just accept the fact they’re going to laugh at you now. Informative site. Will pass along to my steampunk friends. Excellent! Thank you! I’m glad you liked it. Its like you learn my thoughts! You appear to understand a lot approximately this, such as you wrote the ebook in it or something. I believe that you can do with a few % to drive the message home a bit, but other than that, this is magnificent blog. An excellent read. I’ll certainly be back. A fine is a tax for doing wrong. A tax is a fine for doing well…. I’ll immediately grab your rss feed as I can’t to find your e-mail subscription hyperlink or newsletter service. Do you have any? Please permit me recognise so that I may just subscribe. Thanks.